On Friday, July 14th NBA All-Star and MSU Legend, Greg Kelser will come to Meridian Township to commentate the Gus Macker Basketball Tournament "Tip-Off Celebrity Game" at 7:00 pm on the Top Men&apos;s & Women&apos;s Court next to Studio C! in the parking lot of the Meridian Mall. Greg Kelser will also be hosting a book signing in the Meridian Mall Center Court before the “Tip-Off Celebrity Game” from 4:00 pm to 6:00 pm. Players, families and community members are invited to meet the local legend and purchase his book. Of course Kelser, Special K as he is also known from his playing days, along with Earvin “Magic” Johnson, helped lead the Michigan State Spartans to victory in the 1979 NCAA Basketball Championship and went on to play for the Detroit Pistons. 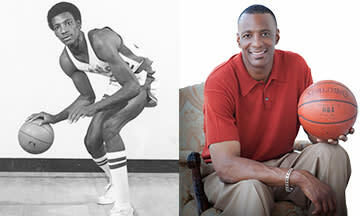 Today he is a television sports commentator, founder of the Gregory Kelser Basketball Camp, and motivational speaker. The Gus Macker 3-on-3 Basketball Tournament will take place on Central Park Drive, behind the Meridian Mall on Saturday July 15th and Sunday July 16th. All proceeds from Meridian Township&apos;s Gus Macker will go to benefit the Haslett & Okemos Athletic Boosters and benefit Meridian Township children in need. So totally fun and for a good cause too? Awesome! Big summer time basketball fun going on all weekend for participants and spectators alike. My mind goes back to classic driveway basketball in the summer, playing for pride and showing off your skills under the summer sun. It&apos;s a classic piece of Americana! Get out to the Meridian Mall on the edge of Okemos and Haslett and have a ball! Want more information about the big Gus Macker event in Meridian Township?